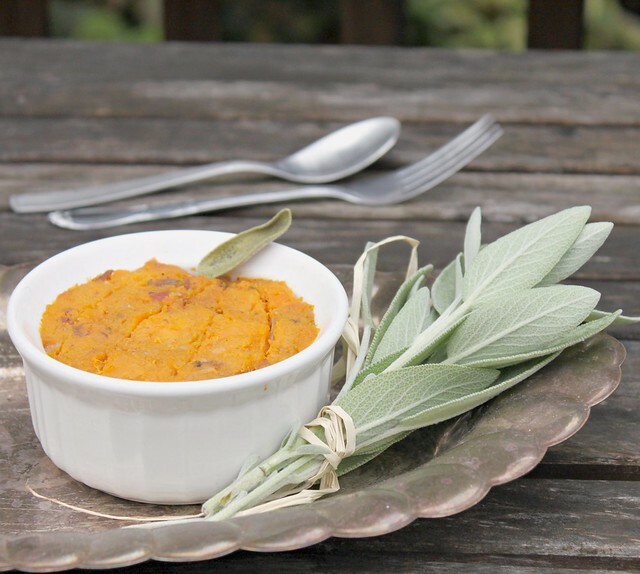 Kitchen Snaps: Mashed Butternut Squash with Crispy Bacon and Shallot ~ The Perfect Autumn Side Dish! 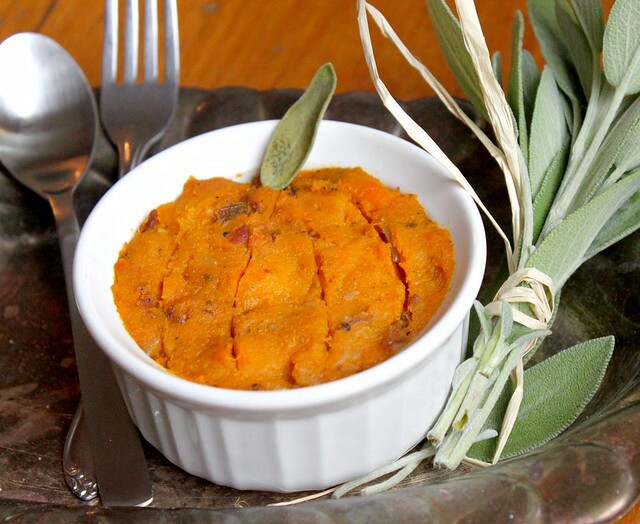 Mashed Butternut Squash with Crispy Bacon and Shallot ~ The Perfect Autumn Side Dish! 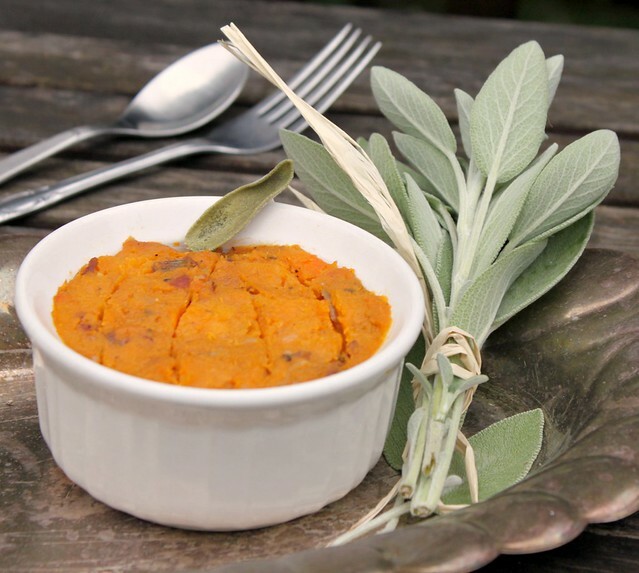 This adorable side dish is perfectly delicious for autumn! Obviously, you do not have to do the whole "pumpkin ramekin" thing (I just thought it was cute) as the recipe concept would be just as awesome ....scooped on to a plate like mashed potatoes ...in casserole form OR used as a bottom layer or "bed" to roasted chicken or pork! Prepare a roasting pan by lining it with aluminum foil, set aside. In the same large pot you cooked the bacon in, add your sliced shallot and allow it to sizzle up a bit in the bacon grease you left in the pot. *The pot should be hot enough to cook up the shallot to a desired slightly crispy texture without having to turn the heat back on - but if not - turn the heat back on for a few minutes until the shallot is finished - just be careful not to burn it. Remove shallot from the pan and set aside. Now, if you haven't already done so, turn the heat back on to medium-high and add the butter. When melted add your butternut squash and stir all around...coating the squash w/the butter. After about 4-5 minutes, add the squash to your prepared pan lined with aluminum foil. Place the pan in the oven and cook until squash is tender, 15-20 minutes. Once finished, add the cooked squash back to the large heavy pot and mash. Add your bacon (crumbling it in), shallot and cheese (if you're using) and stir until well mixed in. Salt and pepper to taste. Spoon into ramekins pressing down with the spoon to make a smooth surface. Make pumpkin lines with toothpick, paring knife or any sharp utensil. If it's still hot, go ahead and eat...or reheat in the oven when ready to eat/serve. Place fried sage leaf on top to represent pumpkin stem before serving. First, I swear I'm not stalking you...I just happened to log into twitter right when you posted this! Second, I love the bacon with the squash. Sometimes it can be a little sweet for me, but the bacon would be a nice way to cut that. @Karen - you are so funny! I am sorry I haven't been a good commenter recently! I'll be catching up later this evening after the kids go to bed! Looks positively outrageous, and a good way to package squash so that even a man will eat it! I've been obsessed with squash lately and I happen to just have bought some bacon! Looks fantastic. We are truly fond of squash. A favor is requested from you. Go to my blog: http://theobsessivechef.blogspot.com and check out my new book. Then do one or both of these: click on the link to purchase a copy and/or mention it on your blog. It would mean a lot to this fledgling author. Thanks. So pretty! I could probably eat this three meals a day and never tire of it. Sounds fantastic. I made this Wednesday night for Thanksgiving...My son tasted a bite & then cried because I wouldn't let him eat more. My father-in-law, known squash hater, ate 2 helpings at our Thanksgiving dinner, so clearly-it was a huge hit! Thanks so much for a wonderful recipie!